Hard work is going on at a Washington, D.C., museum. A man tightens a bolt with a wrench. A farm worker fills his sack with cotton. Rosie the Riveter rolls up her sleeve for a factory job. To be precise, these are depictions of hard work at the Smithsonian National Portrait Gallery. NPR special correspondent Susan Stamberg reports on the exhibition called "The Sweat Of Their Face." SUSAN STAMBERG, BYLINE: A forlorn young girl - she can't be more than 11 or 12 - stands at a long row of spools of thread mounted on a big piece of complicated machinery. 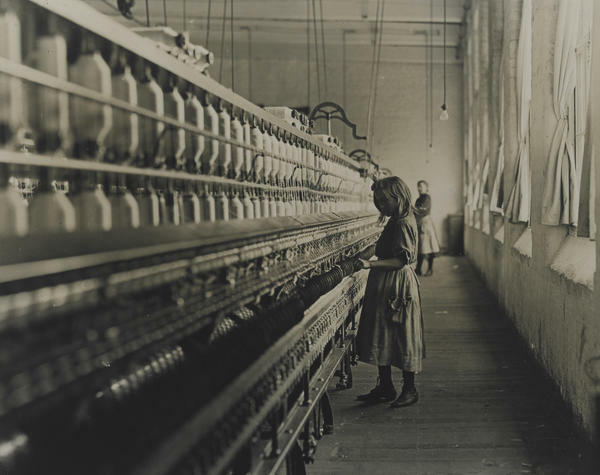 Photographer Lewis Hine wrote her name and height on the back of the picture - Sadie Pfeiffer, 48 inches. So small. She had a summer job in 1908 at the Lancaster Cotton Mills in South Carolina. You can almost hear the noise, feel the heat. DOROTHY MOSS: And there she is, this little girl alone facing an enormous machine. STAMBERG: Dorothy Moss curated this show. Lewis Hine was a crusader. His cause was to abolish child labor. MOSS: He would often disguise himself as a Bible vendor or a newspaper deliverer - other professions to get into these mills. STAMBERG: Hines put himself at risk to take these pictures. With the camera as witness, reforms and regulations were enacted. The Portrait Gallery exhibition is witness to centuries of American workers. MOSS: The people who were building this country, who may be on the sidelines, who are not always the focus of our attention - but because artists often identify as workers, artists felt strongly to bring these people's stories out and to honor them. STAMBERG: In this century, LA painter Ramiro Gomez honors the work of his parents. STAMBERG: And your father - what does he do? GOMEZ: My father is a truck driver. STAMBERG: Gomez adds workers like these onto copies of iconic American paintings like David Hockney's image "Man In Shower In Beverly Hills." Gomez deletes the man. MOSS: And he's inserted the cleaning woman. 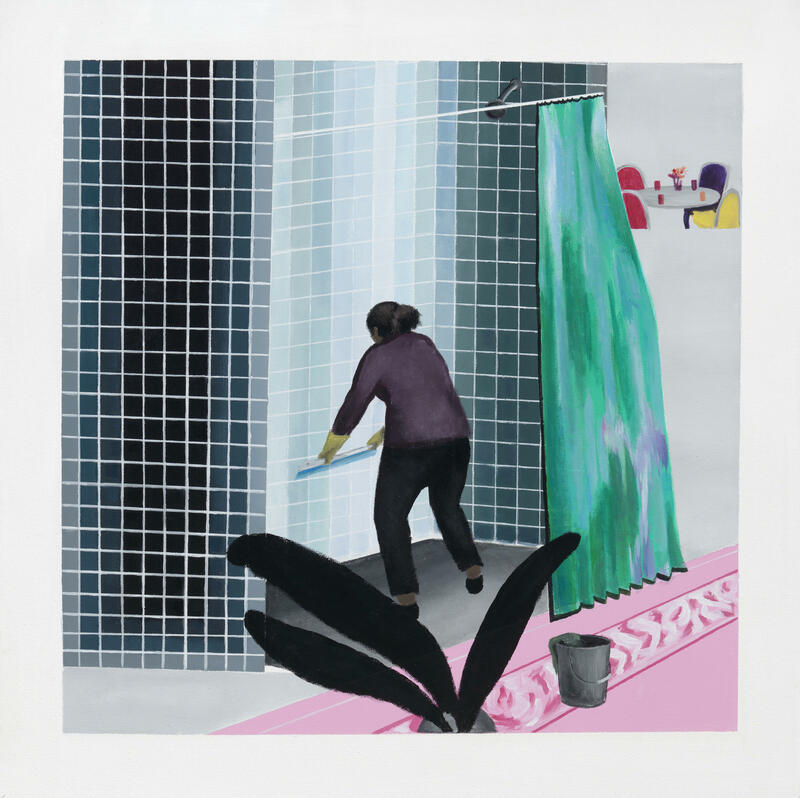 STAMBERG: We can't see her face, just her hands squeegeeing the shower tiles. Gomez is making the invisible visible. He and others in the show take workers we never notice and make us notice. 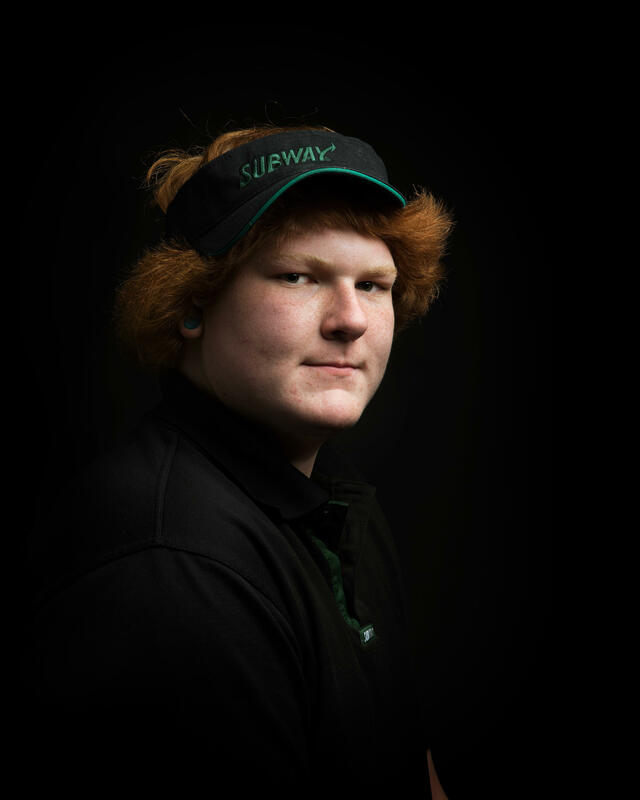 A food worker in a Subway sandwich store gets the full treatment from photographer Shauna Frischkorn. She puts him - he's a kid named Kean - against a black background and lights his face to look sculptural. The black and green Subway cap sits on his red hair like a crown, like a Renaissance portrait but with a little smile - a twinkle. MOSS: She's restoring his humanity through the pose and lighting. STAMBERG: While the workers aren't known, some of the artists who portray them are famous - photographers Dorothea Lange, Gordon Parks, Ansel Adams; painters Winslow Homer, George Bellows. And some are less familiar. John Neagle was fashionable in his day. 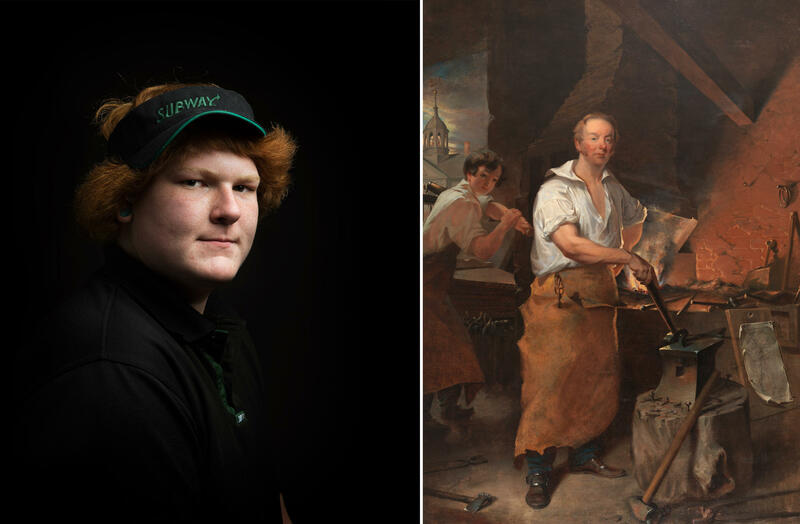 But now his 1829 portrait of Pat Lyon is a marvel - big, beefy guy in a leather apron, a blacksmith at his anvil. MOSS: You can see the muscles straining in his right arm. STAMBERG: Pat Lyon was falsely accused of theft, jailed for three years, then became a wealthy businessman. Yet the painter shows him sweating at his anvil, at Lyon's request. MOSS: He said he wanted to be shown as a working man because the working people of this country are the most honest people of the country. 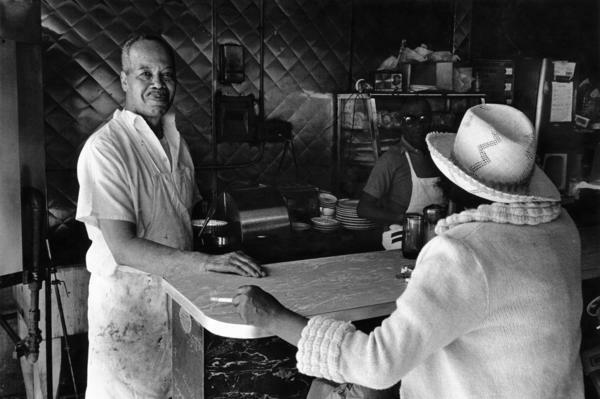 STAMBERG: When I asked curator Dorothy Moss for the image of someone lucky enough to be taking pleasure in his work, she led me to Dawoud Bey's 1976 photo of "Mr. Moore's Bar-B-Que, 125th Street." The owner is beaming at us from behind his Harlem lunch counter. He's looked up from talking with a customer waiting for her food. She's smoking, and she better flick off the long cigarette ash pretty soon. Mr. Moore's apron is stained - probably barbecue sauce - and he looks so welcoming and proud. Well, you want to go sit at that counter and talk to him. MOSS: You really do, I know. It looks like a wonderful place to spend an afternoon. STAMBERG: Workers of the world - well, America anyway - unite at this Portrait Gallery exhibition. "The Sweat Of Their Face" reminds visitors of the range of vital work we do and the ways we feel about it. (SOUNDBITE OF JOSE GONZALEZ'S "WHAT WILL (WITH THE BRITE LITES)") Transcript provided by NPR, Copyright NPR.